The Yogaslackers E-Line kit is a low stretch slackline built for yoga. Closed loop design allows for a simple set up so you can quickly straight to the low resistance workout. Build a stronger core, improve balance and experience the yoga roots of slacklining. 50 feet long allows you to set it up in a backyard, public park or just about anywhere with some solid trees. 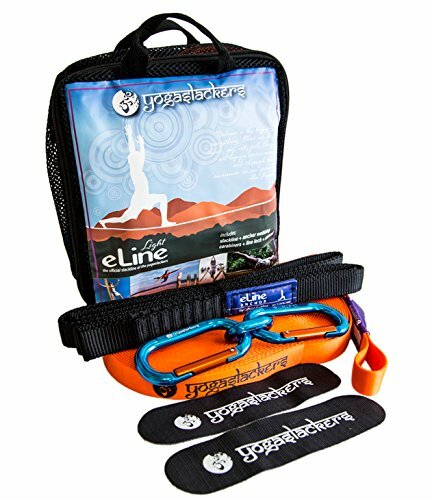 KIT INCLUDES: 2 oval carabiners, 1 6.5ft strap, line lock and a 50ft x 1in low stretch yoga slackline. If you have any questions about this product by Yoga Slackers, contact us by completing and submitting the form below. If you are looking for a specif part number, please include it with your message.